dnacreations provides complete web hosting services for every site we develop. 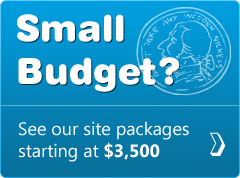 Almost all of our customers that we build websites for end up choosing us for hosting as well. We manage our own dedicated servers at secure redundant data centers and offer far better server resources per site than you would find in typical low cost shared hosting environments. Our servers are housed at state-of-the-art data centers that are backed by complete redundancy in power, HVAC, fire suppression, network connectivity and security. If one system experiences a disruption for any reason, another one picks up the load instantaneously. Our data center offers an unrivaled 100 gigabits per second speed which eliminates bandwidth traffic jams and roadblocks to assure high volume, instantaneous response for hosted applications. By using multiple Tier 1 telecom providers and direct Internet connections, we are able to provide you with the connectivity, bandwidth and stability you simply can't find anywhere else. We have standard low cost hosting packages that meet the needs of the majority of our clients, but also offer more robust hosting packages for website and web services that have higher loads, storage and bandwidth requirements. We host on a virtual server environment that allow us to instantly scale in processing power, server memory (RAM), and storage. We can quickly scale up at a moment's notice without any disruption to our clients' websites. Additionally, for very high traffic and bandwidth needs that are driven by consumer advertising and experience extreme traffic influxes in short periods of time, we offer Next Generation Cloud based hosting services as well. Contact us to learn more about how we can help you with not only your website development needs but also your web hosting needs.